As a part of the Greater Seattle area, AG Consulting Partners recognizes our responsibility to ensure our community continues to thrive in the future. 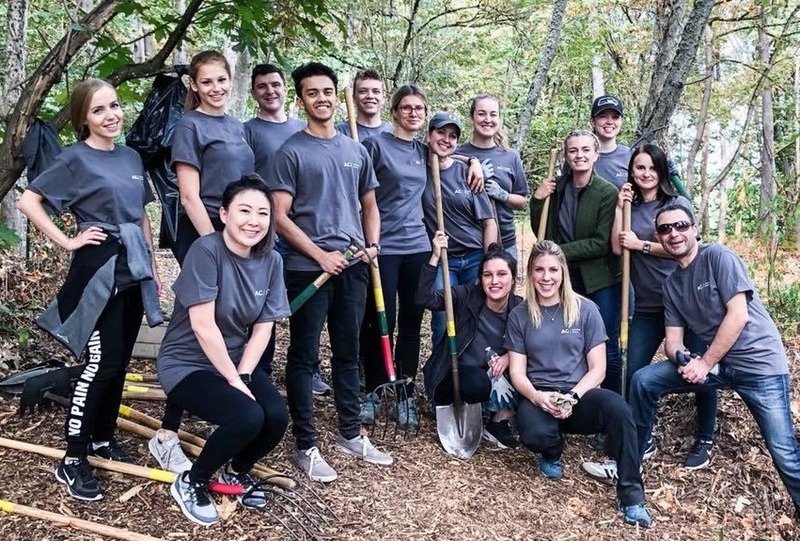 Rashell Iakhimovich, an AG Consulting Partners Consultant and Washington native partnered with Mountains to Sound Greenway to provide employees with the opportunity to provide environmental restoration services to the local community on Mercer Island. Together, they cleared invasive weeds and natural debris to promote growth of more trees in a trail area near Gallagher Hill. Mountains to Sound Greenway also took the employees on a tour of the extended area to educate them on the local ecosystem in order get a better understanding of the impact of their work. Where does your passion for local conservation stem from? It’s been an accumulation of passions and interests over the years. When I was in high school I didn’t consider myself an environmentalist, but after having traveled and returned home, I’ve been amazed by the beauty of the Seattle area. I just couldn’t believe how lucky I was to live in such a stunning environment… there’s just nothing comparable. After realizing how special it is, it became more important for me to be involved in local conservation efforts. How did you get involved with Mountains to Sound Greenway? I discovered them completely on accident. In college, I volunteered with the University of Washington’s College of the Environment with restoration efforts in Seattle parks, but I couldn’t remember any of the organizations we had partnered with. I called around to some city councils about volunteering opportunities and they connected us to Mountains to Sound Greenway. There are many environmental NGOs. Why Mountains to Sound Greenway? I always believe that charity should start at home. It’s important to start local because that’s where you can start to see an impact, and when our community is taken care of, we can extend our efforts as a unit, it’s like a domino effect. Mountains to Sound Greenway is a truly local organization in that it is operated and funded by Washingtonians for Washingtonians that are passionate about preserving the beauty of our surroundings. How did AG Consulting Partners support your passion for environmental conservation? AG Consulting Partners supported me by offering the park restoration project as a paid day of service and providing lunch. This incentivized employees to spend their Friday with me, giving back to the community. I couldn’t have done it without their support! What are some lessons that you learned from your partnership with Mountains to Sound Greenway? Pick up the phone and get involved. It can sometimes be difficult to find volunteer opportunities online. Get on the phone, talk to people, and get engaged. You’ll be surprised by what you find and how willing people are to help. Don’t Give Up: Things go wrong all the time when planning large events. Just because a challenge gets in the way does not mean you should ditch your effort. Take a breath and tackle it from a new angle. Mountains to Sound Greenway is a local trust that leads and inspires action to conserve and enhance the landscape from Seattle across the Cascade Mountains to Central Washington. They work to ensure a long-term balance between people and nature. If you want to learn more about Mountains to Sound Greenway and their work, visit their website at mtsgreenway.org.